Using a sharp knife, slice off the thin rind on the top of the wheel of Brie. Place Brie in a shallow ovensafe baking dish or pie plate cut side up. In a small bowl, mix together brown sugar, flour, and chopped nuts. Add melted butter to form crumb topping. Sprinkle crumb topping on top of Brie and bake about 15 minutes, or until the cheese is slightly melted and topping is browned. Serve warm with Toasteds sesame and wheat crackers. In a large bowl, cream butter and both sugars until smooth and creamy with a hand mixer. To creamed mixture add vanilla and eggs, one at a time, and beat well. Beat in butterscotch pudding mix, salt, baking soda, and flour, one cup at a time, until just combined. Stir in chocolate chips and with a cookie scoop, drop dough evenly onto a cookie sheet covered with parchment or Silpat® and bake for 9-10 minutes. For a more butterscotch flavored cookie, use a large package of pudding mix and reduce granulated sugar by 2-3 tablespoons. Preheat oven to 425 degrees F and pre-bake one of the crusts in a 9-inch pie pan until golden brown, making sure to pierce the crust with a fork. In a medium saucepan over medium heat, lightly sauté carrots in 1 tbls. butter. Add stock and boil for 10-15 minutes, until slightly tender. Remove from heat, drain (reserving cooking liquid) and set aside. Meanwhile, in a large sauté pan over medium heat, cook onions and celery in remaining butter until soft and translucent. Stir in flour, salt, pepper, and celery seed. Slowly stir in reserved cooking liquid and milk. Simmer over medium-low heat until thick. Remove from heat and set aside. In a large bowl mix together cooked chicken, frozen vegetables, carrots, and thickened cooking liquid. At this point taste mixture and adjust seasonings as needed. Add mixture to pre-baked pie crust. Cover with unbaked top crust, seal edges, and cut away excess dough. Form excess dough into a ball, roll it out and cut into shapes to decorate top of crust if desired. Brush beaten egg white over entire crust. If you wish to add cutout shapes, place them on top of the brushed crust, making sure to also brush the top of the cutouts. 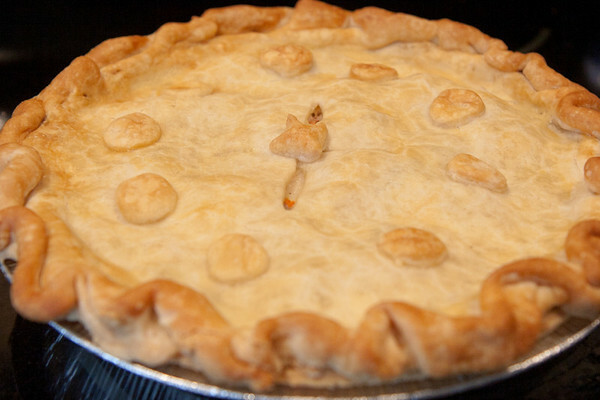 Make 4 small slits in the top of the pie to allow steam to escape and bake for 30 to 35 minutes, or until top is golden brown and filling is bubbly. Cool for 10 minutes before serving. This recipe is for one of my friends who is getting married soon and is looking for good recipes to keep in her arsenal. If you have any that you would like to share, feel free to let me know and I will pass them along! I love how the Lord allows a thing like food to bring people together and closer to Him as they fellowship together. It’s so great to see how as they learn together, mess up together-even in the kitchen, and do this crazy thing called life…He is there every step of the way. I am such a believer in the fact that God is not confined by the walls of a church, but that He desires to be involved in every area of our lives. All that to say, here is your recipe! In a sauté pan-over medium high heat-cook bacon until crispy. Add add diced onions, garlic, celery cooking until tender. Deglaze pan with ½ c. of chicken stock and transfer to a large Crock-Pot. Add chopped green chilies, chicken, rinsed beans and remaining chicken stock. If you want a "meatier" chili add less chicken stock. Stir in cumin, coriander, oregano, and cayenne pepper. Cook on low for 2-3 hours, adding cornstarch slurry during the last 20 minutes of cooking to thicken to desired consistency. Serve chili in a bowl. Garnish with any combination of cheese, cilantro, sour cream, diced jalapeño, or Tabasco chipotle hot sauce. Summary: This soup has no bells or whistles–just simple goodness that will send a cold on the road in a hurry. In a large stock pot, saute celery and onion in olive oil. Add chicken, carrots, thyme, and stock. Simmer for 30-60 minutes. Add noodles, and simmer for 10 additional minutes. Season to taste and serve. Summary: While homemade stock is a great thing to keep on hand in the freezer, I have found that oftentimes I lack the time to make it! I make my “homemade” stock by cheating and starting with a store bought broth as my base. Doing this will save hours of your stove churning away on low. 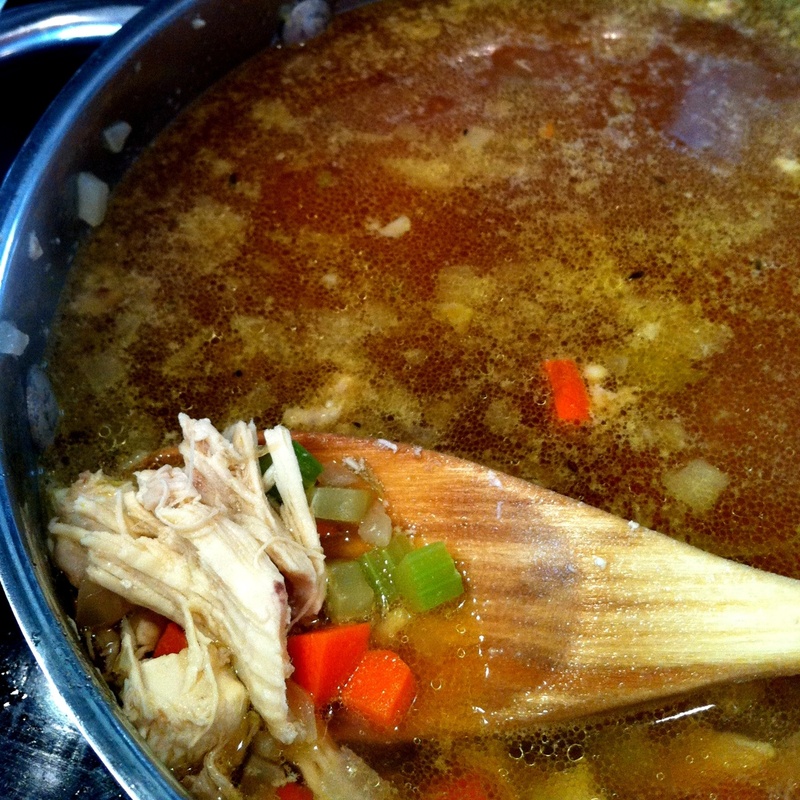 Place chicken, onions, carrots, celery, garlic, herbs and spices in a stockpot and cover with chicken broth and water. Cook on high heat until liquid come just to a boil. Reduce heat to medium low and cook until chicken reaches 165º F.
Remove chicken from stockpot and pull all meat from the bones. Let meat cool and save. If not using immediately, chicken can be placed in a freezer bag and frozen for later use. Strain stock through a fine mesh strainer into a heatproof container removing remaining solids. Cool immediately in a sink of ice water to at least 70º F. Continue chilling in the refrigerator, uncovered, until temperature is below 40º F.
Once stock is below 40º F cover and refrigerator overnight. Remove solidified fat from surface of liquid and store in refrigerator for 2 to 3 days or in freezer for up to 3 months. In my stock I use a whole chicken, because I like to keep pulled chicken in my freezer for other recipes, however you could also use 3-4 lbs. of chicken carcasses to make the stock.